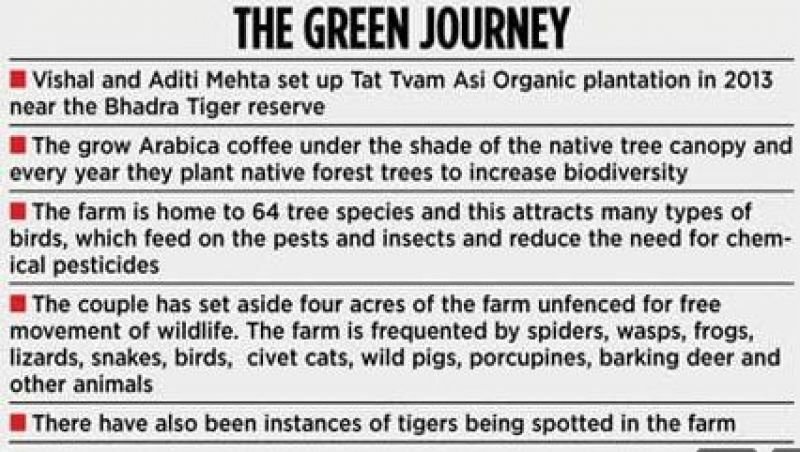 It was in 2013 that their Tat Tvam Asi Organic plantation came into being near the Bhadra Tiger Reserve. Vishal and Aditi Mehta foster wildlife on their organic coffee plantation while making sure the brew you have in the morning is of high quality. 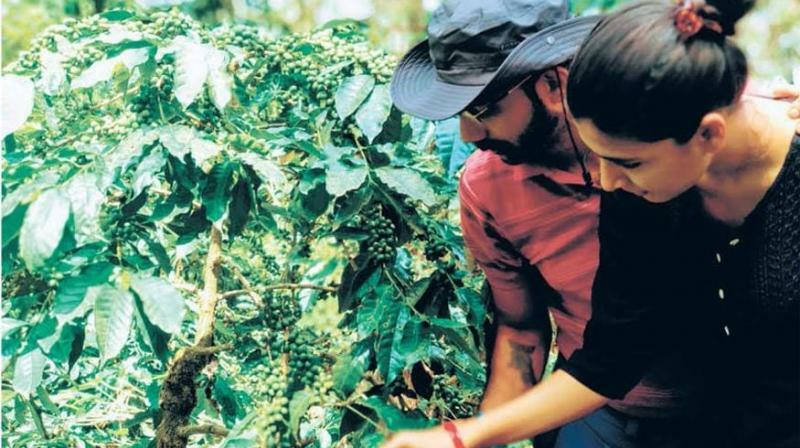 The state may have suffered deforestation and its wildlife may be losing its habitat, but providing hope are a young couple, Vishal and Aditi Mehta, who foster wildlife on their organic coffee plantation while making sure the brew you have in the morning is of high quality. It was in 2013 that their Tat Tvam Asi Organic plantation came into being near the Bhadra Tiger Reserve. Vishal Mehta, who travelled all trhe way from Kolkata to the Western Ghats to fulfill his deam of organic farming, says it is possible to conserve nature and still be profitable. "It is possible and not just on a coffee plantation but on any farm. Indian coffee is grown in one of the most sensitive hotspots of the world called the Western Ghats which is home to numerous species of flora and fauna. We grow our Arabica coffee under the shade of the native tree canopy and every year plant native forest trees to increase the biodiversity of our farm," he explains. Vishal and Aditi Mehta at their Tat Tvam Asi Organic plantation near Bhadra Tiger Reserve. It's a win-win situation as the plantation's biodiversity attracts a host of birds, which feed on the pests and insects and reduce its need for chemical pesticides. "To be profitable, we bank upon the fact that Indian coffee is creating a niche for itself in the speciality coffee sector and is known to the world as sustainable quality coffee produced in harmony with nature," says Aditi. The couple has set aside four acres of the farm for wildlife and left it unfenced. "This has resulted in an excellent population of spiders, wasps, frogs, lizards, snakes, birds, civet cats, wild pigs, porcupines, barking deer and so on in our midst. We have left 90 per cent of our estate unfenced to allow the unhindered movement of these animals. After all, we are in their home and cannot lock them out of it," she adds. The results have been overwhelming. Over 64 species of trees have been found on the farm in a biodiversity survey conducted on it and numerous encounters have been reported with tigers, barking deer, wild boar, and 18 species of butterflies. "People have purchasing power. We need more and more of them to buy products that are organically grown and ethically sourced, as this will in turn foster a green economy," stresses Vishal. On the contrary: Rajat Gupta - Big fish or pawn?